Here in The Village, we pride ourselves in allowing our residents a full and free rein to explore the grounds to their hearts content. Every door is open (except for those which are locked), and everyone is encouraged to share their INFORMATION to their fullest desire. We only ask that you refrain from asking the wrong kinds of questions, as we want everyone here to be happy and carefree! With these endearing sentiments in mind, we offer the following tentative itinerary for you to follow during your stay, so that you and your fellow resident travellers enjoy a wonderful #4life time! Office Hours: The Internet is open 24/7. Rover is always watching. There’s some Neat Stuff in The Office. Please Note: The holiday Itinerary is subject to change depending on the way in which the class unfolds. This summer holiday experience is not predicated upon coverage, but rather focused on creative application and interaction with a series of ideas and a wide-range of media. This 7 week session is completely online. Success in this class hinges on managing time, proactively seeking assistance when needed, and committing regular effort several days a week on the work. ds106 is focused on developing a broad range of skills in telling stories across various media including, but not limited to, the following: text, photography, design, audio, video, code, and mashups. The various stories you create will be shared openly through your own online space(s) that will, over time, come to define a broader narrative of your development throughout this class. Your personal site is the canvas for a semester’s worth of art, and hopefully well beyond that. 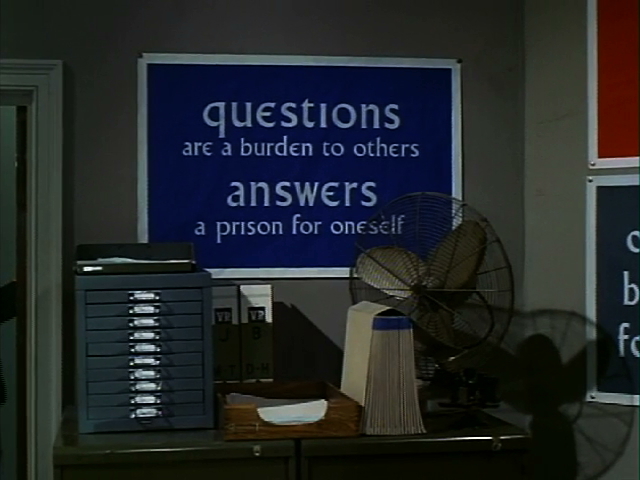 For this iteration of the experience, we will be exploring themes located within the cult 1968 spy/adventure/sci-fi series The Prisoner to inform the various stories we both consume and create. Internet: There is no textbook for this class, however individual readings/videos will be available online. Success in this class is very much dependent on a reliable, fast internet connection. And in staying on the good side of Number 2 and Rover. Computer: Do we need to even list this? Make sure you have a computer you can access whenever needed, not a borrowed one. It will need to be the best one you can have available. It should include a built in or attached camera for live video sessions, and you should have a pair of headphones or earbuds. Over the course of the summer, you will probably need to download and install some free and/or open source software to complete various media assignments, so make sure you have the necessary access/permissions to do this. Web Accounts/Software: You will need to set up accounts on various social media sites we will be using for class. For the most part, no specific software is required; you will need to use what you have or choose from web-based/free/trial versions of software to create media. Web Hosting Account & Domain: You will be expected to manage your own web hosting account (most participants use WordPress) where you can aggregate your work. ds106 Assignment Repository: This collection of digital storytelling assignments has been developed over the course of the last few years. We will frequently be drawing upon this collection for course assignments. You will also be creating assignments as part of your stay within The Village. The Daily Create: These daily creative assignments ask you to spend no more than 10-15 minutes experimenting with either photography, video, audio, or text based on a pre-defined assignment. They are excellent activities for encouraging relaxation, reflection, and INFORMATION extraction. The Social and Tour Activities for each week of your stay in The Village will be posted Mondays to the prisoner106.us web site and will appear on the Weekly News page. Each weekly post will outline the work for the week and will include videos and readings as assigned. We cannot re-iterate enough how important it is that you commence relaxing immediately at the beginning of the week. If you follow the advice of current and former Residents, you will hear again and again how this is not a resort in which you can just “get by” by keeping your head down and hiding out in your room listening to The Radio. By Sunday at midnight, you are required to have completed the week’s work so that you can receive your allotted Credit Units for your activity for that week. Electricity to your bungalow will be promptly cut off at midnight if you have not accumulated sufficient Credit Units. Go to The Village information station and review the weekly assignment announcement available on the Weekly News page. Begin relaxing, touring and enjoying your activities for the week. Engage in all of the activities for the week. Follow the activities of your Fellow Residents and comment on them. Use Twitter and your blog to share your adventures, successes, questions, etc. This class will in many ways be anchored around your ongoing, regular participation within The Village through the various technologies you will be experimenting with. If you are not seen engaging in Village Activities, or if you are discovered to be engaging in Unmutual Activities, you will compromise the operation of The Village and your continued existence in it. We expect active and engaged participation. Rover is watching (@theVillageRover, on Twitter). Narrating your Village experience. Throughout your stay, you are required to use your blog to regularly provide updates about your holiday activities. These posts should be substantive, thorough, reflective, and full of INFORMATION. Commenting upon your Fellow Residents’ work. You are expected to respond thoughtfully and critically to the work that others in The Village are creating. This will be accomplished in several ways, primarily through regular, thoughtful blog comments and feedback on Twitter. You may also buy them tea or coffee in The Village Cafe. Engaging with social media. The online nature of this somewhat virtual holiday resort requires us all to work especially hard to build a collaborative community. In large part, we expect this community to emerge out of various spaces and tools that you will be asked to use. We will be looking for your regular presence in spaces like Twitter, Flickr, Soundcloud, and YouTube. Complaining that you “don’t understand” the tool, or that you are “not a number” is not a suitable excuse. You will only begin to understand by using and engaging. Conform and Assimilate into The Village community. Participating in the course narrative. As the summer progresses, you will be expected to eventually take on a role in the narrative of the course. Your participation in this part of the course will develop naturally through the weekly assignments, but you are expected to actively and enthusiastically engage in the story that unfolds. The first week of your holiday acclimatization within The Village will consist of ds106 “Prisoner Assimilation.” During this time, you will be given a list of tasks that you must complete in order to demonstrate that you understand the basic tasks and activities that will be required of you during your stay. During this time, you will begin the process of personalizing your own web publishing space. And, of course, making GIFs. Regular, creative exercises are at the heart of ds106, and to this end over the course of the semester we will be expecting every Resident to complete between 2-4 Daily Create assignments each week (the number to complete each week will be clarified by Number 2 at the start of the week). In order to get full Credit Units for this assignment you will need to complete it the day the assignment was posted as well as tag it according to the directions given with the prompt. You will be expected to include the work you’ve done for your Daily Creates in your Weekly Summary posts. Throughout your stay in The Village, we will assign a number of digital storytelling projects using a variety of tools, techniques, and technologies. For the most part, these assignments will come from the ds106 Assignment Repository. You are expected to complete all of these holiday diversions by the weekly deadline and share them on your site, and in your weekly summary. Your allocated Credit Units for the week will reflect both your success at completing these holiday diversions as well as a detailed commentary on your blog describing your process and any difficulties you encountered. In other words, you will be expected to not only complete a holiday diversion, but also share with everyone how you did it. What’s more, if you have difficulty with a holiday diversion, we will always expect you to attempt it, but you can use your blog to share INFORMATION about what you found challenging and how you negotiated the requirements and steered clear of Rover. The work itself must be embedded as media to view directly in your posts. You will not get credit if you merely provide a LINK to an image, video, etc. A narration of the story behind it, what was the inspiration? What is the meaning to you? What are the elements of storytelling within it? A description of the process, tools, techniques used to create it, as well as hyperlinked attribution to any source media you did not create yourself. Over the course of the semester we would like each of you to come up with ideas for two new holiday diversions (assignments). Each assignment you create must be for a different section of the course (i.e., visual, design, audio, video, and mashup/remix)–feel free to create more than, but that two is the minimum requirement. The assignments should be relatively short and creative. In addition, you must do the assignment you create and document your own process for completing it. You can submit the ones you create at http://assignments.ds106.us/submit-an-assignment/. Remember, each assignment has to be tagged correctly to receive credit—and those tags will be created automatically immediately after you submit the assignment. Don’t forget to tag your example of the assignment you complete. In addition to creating at least two holiday diversions (assignments), you will be required to create at least two tutorials for either assignments you create or pre-existing assignments in the repository. These tutorials can be blog posts with specific instructions or screenshots, screencasts walking an audience through the process, or some other approach to helping others complete the task. A way to consider how these are done would be to ask what sort of tutorial would have helped you best to do the assignment. What are some of the larger issues surrounding your work? These weekly summaries are what we will use to find all of your weekly work as we determine your Credit Unit for that week. In addition, they are an opportunity for you tell us how you feel you are doing and what’s giving you trouble, overall, during your stay within The Village. If you forget to include something in a weekly post, we may not realize you’ve completed it. If you fail to submit a weekly summary, you will get Credit Units for that week! By the time you complete your Vacation, each of you will be required to have worked on a group radio show project. You will be given more than one week to complete this project, as a group, and it will build upon work that you will do with digital audio in previous weeks. The radio shows will be broadcast on the ds106 web radio station. This will be a digital story that you will complete in the final weeks of the class. You will get more information about the requirements for this story later in this semester, but generally you should be prepared to create a larger digital narrative out of media created by others throughout the summer in ds106. As this class is held online within The Village, there will be no established session or class that you must attend every week. Rather, your attendance will be evaluated upon your activity and presence in the course’s online spaces: your blog, Twitter, comments on your classmates blogs, etc. And clearly, you will not be leaving The Village. Inactivity will be interpreted to be synonymous with an unfortunate demise on your part. All weekly work must be posted to your web site and your weekly summary post URL must be posted by midnight Sunday of the week they are due. We realize life presents unexpected situations, but unless prior arrangements have been made with your hosts, no work will be accepted for Credit Units after the weekly deadline. As indicated earlier, electricity to your bungalow will be unceremoniously terminated at midnight if you do not have sufficient Credit Units available to support your continued use of our facility. We trust that this single warning, in advance, will be sufficient. Please strive to be a considerate class member, both to Number 2 and your fellow Residents. For many of you, the only interactions you will have with both your instructors and fellow internauts will be within The Village, and the expectations of amiable, non-threatening interactions are equally important online as they are in-person. Additionally, context can be tricky online, so be sure to try and be as clear as possible, while also giving your Fellow Residents the benefit of the doubt. Much of your work in this class will be providing one another feedback on the stories you create, critique is essential, but the magic of community is in how your frame it. Be good and do good. Be Seeing You!